Gather, twist, and stitch 132 flowers, leaves, and garden extras from ribbons and lace. 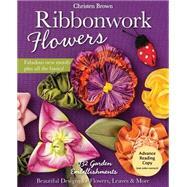 Christen Brown, author of best-selling Ribbonwork Gardens, shares fresh twists on vintage ribbonwork construction with colorful how-to photos. Fashion your own floral arrangements from interchangeable petals and leaves, two never-before-seen stem designs, and swappable centers. A gallery of bouquets will inspire you to stitch realistic blooms, embellished with fruit, flourishes, and garden accessories. Embellish wearables, accessories, and home decor with single-stem posies and bountiful bouquets.